Made in Germany, the ESSENTIAL G is one of the most technically advanced upright vacuum cleaners in the world, and it offers two power head widths; the 12-inch ESSENTIAL G1 and the 15-inch ESSENTIAL G2! 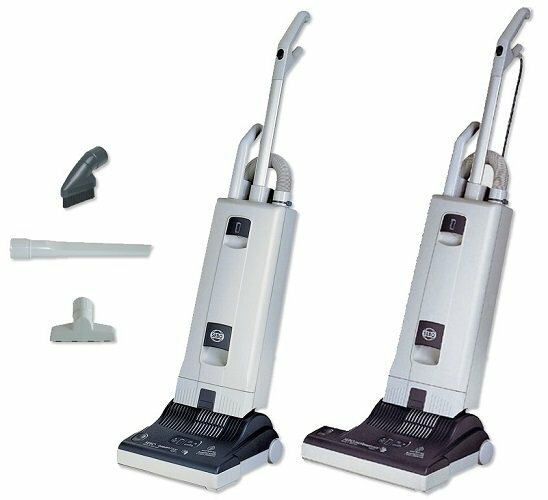 Both models feature an electronic controller that acts as a brain, alerting users to a clog, a worn brush, a full bag, when brush height is set too high for optimal cleaning, and shuts off the vacuum automatically when brush roller obstructions occur, which protects the motor, belts and carpets from damage. Both power heads have four-level manual height adjustment, effectively clean carpets and hard-floor surfaces, and have excellent pet hair removal! Because of their commercial-grade quality, the ESSENTIAL G1 and ESSENTIAL G2 provide years of reliable use! They even have an exterior housing with a scratch and scuff-resistant matte finish and a soft-start feature that extends motor life. They also have a convenient instant-use cleaning wand and suction hose with an eight-foot reach, three on-board tools, and a five-year parts and labor warranty. 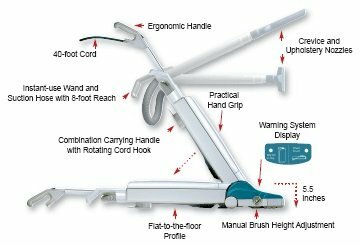 Additional features include excellent filtration, a giant 1.4-gallon bag, an extra long 40-foot cord, protective rubber-coated wheels, a low 5.5-inch horizontal cleaning profile that fits under beds and furniture, and tool-free brush roller removal for replacement or bristle cleaning.